It's been over 1.5 years since I'd posted an article on integrating ASP.NET Core 1.x applictions with Azure AD B2C. As I was upgrading my sample application to ASP.NET Core 2.0 it became obvious that changes that I had to make were not only limited to the revamped authentication middleware and security related APIs (a great summary of which can be found in this issue on GitHub). Azure AD B2C has greatly evolved too and now it supports separate API and client apps, delegated access configured with scopes and proper access tokens. It's too many changes that have literally rendered my previous post obsolete and prompted me to write a new version of it. A sample application is available on GitHub. It consists of a Web API project (which is pretty much the default template armored with JWT Bearer authentication middleware) and an MVC client that calls the API and displays a list of claims it receives in the ID token. The application uses the Hybrid Flow and supports common customer facing scenarios such as self sign-up, profile editing and password reset. It demoes configuration of the ASP.NET Core authentication middleware for OpenID Connect and the Microsoft Authentication Library (MSAL). 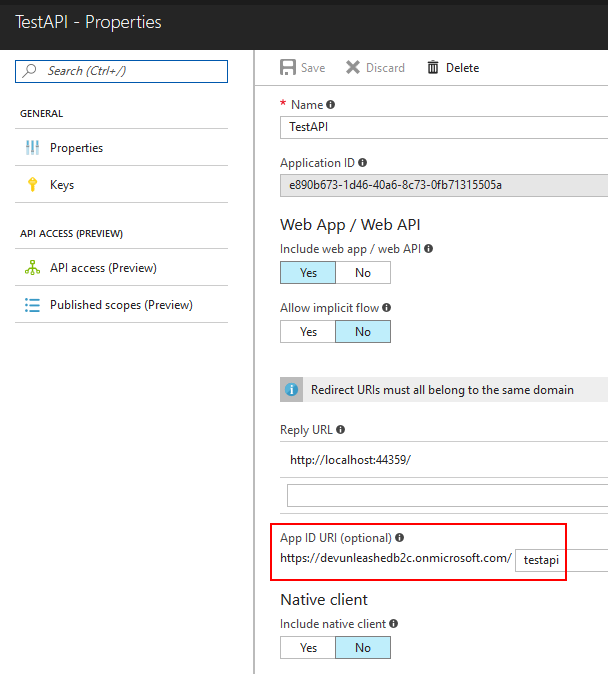 Just like you do in the regular Azure AD you can now register separate applications in B2C to represent your APIs and client applications. 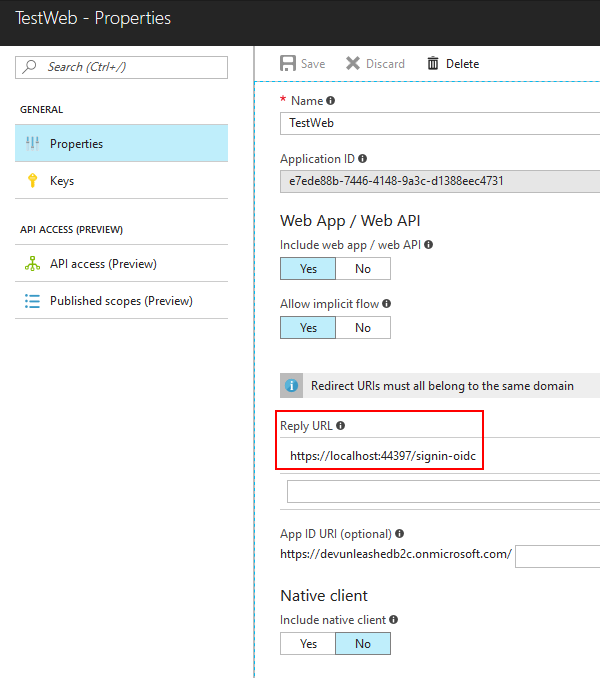 You can further fine-tune what delegated permissions are required by the clients and you get normal access tokens in additional to ID and refresh tokens from Azure AD B2C (for those who are new to B2C, in the past you had to use the same app for APIs and clients and use ID tokens in place of access tokens when calling your APIs). One important setting to make sure to specify for the API app is the App ID Uri. This Uri is going to be used as a prefix for custom scopes that your API exposes and that should be requested by clients. You declare your custom scopes in the "Published scopes" section of the API app. This is the value that should be included as part of the scope parameter by the client when making requests to authorize and/or token endpoints. Note by default all apps come with the user_impersonation scope that can be used if there is no need to limit what portions of the APIs are available for particular clients and they just need to be able to call the APIs on behalf of signed in users. For the client app it's important to specify reply Url(s) which should contain those to be specified when making requested to the directory. If your client is confidential (that is, a server side application) you need to generate client keys in the appropriate section of the blade. Full client credentials are required by the Authorization Code and the Hybrid flows. Finally, you assign exposed scopes of APIs that need to be available to clients. In Azure AD B2C policies define the end user experience and enable much greater customization options than the ones available in the classic directory. Official documentation covers policies and other concepts in great details so I suggest you have a look at it. Not only does it provide policy specific endpoints, it also gives information about claims that I configured to be included in tokens for this specific policy. While we're at it, it's essential that we properly configure claims to be included in tokens when using all planned policies. Each policy has the same set of settings and first of all it's important to include the Object ID claim which is the unique identifier of the user. It's important to enable it in all policies that are going to be used in your application and here is why. Different scenarios such as profile editing or password reset are handled by redirecting the user to the authorize endpoint. And upon return the application is supposed to reconstruct the security context and follow the OpenID Connect spec to redeem the authorization code (yes, all these scenarios are piggy backed on the standard flows). User ID is the essential claim to be present in all responses from the authorize endpoint. For example, it's used as part of the token's cache key which we're going to talk about later in this post. The first one is the sub claim that often represents the user ID. 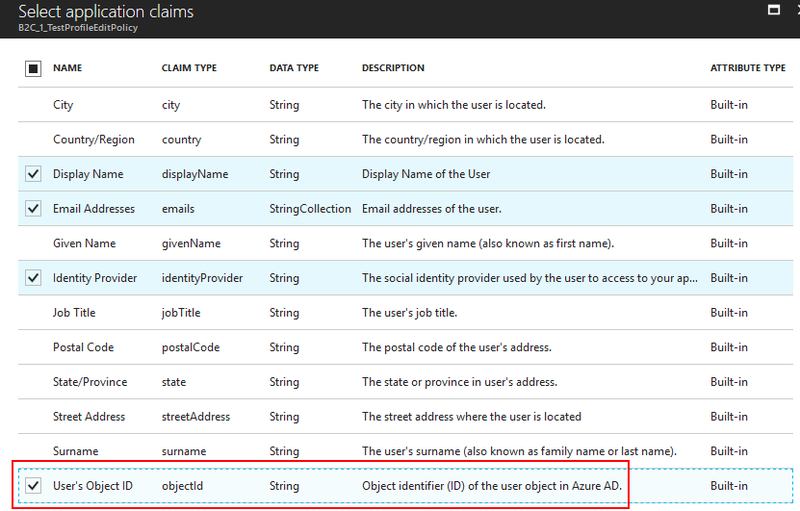 Because we've already included the Object ID (oid claim mapped to http://schemas.microsoft.com/identity/claims/objectidentifier claim type used in .NET) we can disable it (that's why you see the unsupported message for the nameidentifier .NET claim in the sample application). The second claim is the one that identifies the policy that was used to call the authorize endpoint. This claim is used later when you need to redeem the authorization code by calling the appropriate token endpoint or when signing out the user. By default it's set to acr which is mapped to http://schemas.microsoft.com/claims/authnclassreference claim type in .NET. By the way, all these claim mappings can be customized and even disabled so you can use short claim types (e.g. sub, scp, etc) but this is a topic for another post. Sign up and Sign in. This is a combined policy that enables self sign-up. Instead of setting the authority (which is the tenant's URL in the classic directory), you specify the full URL to the OpenID Connect metadata endpoint. This way you can specify the policy parameter. What's interesting is that even though you can request access tokens using various policies your API app will be able to validate them using just any of them. In a web client you use a pair of the Cookies and OpenID Connect middleware and also the Microsoft Authentication Library to help with token management. Notice how you set the OpenID Connect middleware to be used for challenge requests and the Cookie middleware for the rest. Another important thing to remember is to include the same set of scopes when redirecting the the authorize endpoint as well as redeeming the authorization code (shown below). Otherwise the response from the token endpoint won't include access and refresh tokens. The idea is to use proper URLs for the authorize endpoint depending on the policy that is set by the AccountController in response to appropriate actions: sign in, sign up, edit profile, password reset or sign out. Please check out the code to get a better picture of how things work. The alternative solution would be using the tfp URL formats and replacing the policy name in the URL itself. Microsoft Authentication Library (MSAL) is the "next generation" library for managing tokens that should be used with v2 endpoints (as apposed to Active Directory Authentication Library (ADAL) that is to be used with classic v1 endpoints). Specifying a per-user token cache (described below). Specifying the authority using the tfp format and policy name from the acr claim. 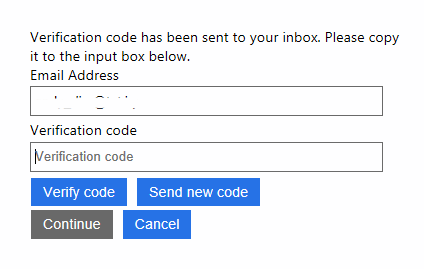 This is important as this code is going to get executed as part of sign-in, profile editing and password reset flows. Failure to provide the correct policy will result in the following error: AADB2C90088: The provided grant has not been issued for this endpoint. Actual Value : B2C_1_TestSignUpAndSignInPolicy and Expected Value : B2C_1_TestProfileEditPolicy. 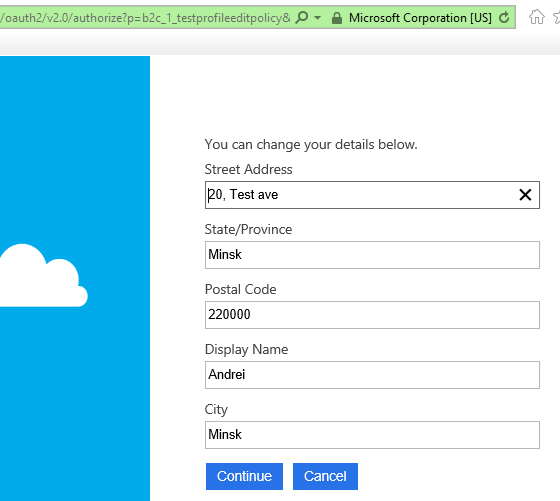 Sending the same set of claims the token endpoint that you send to the authorize endpoint. Notifying the OpenID Connect middleware that you've redeemed the code by calling HandleCodeRedemption. The cache relies on IDistributedCache abstraction and you get in-memory, Redis and SQL Server implementations in ASP.NET Core out of the box. There is nothing we need to do in regards to the security context because profile editing could only be triggered when the user had already been signed in. 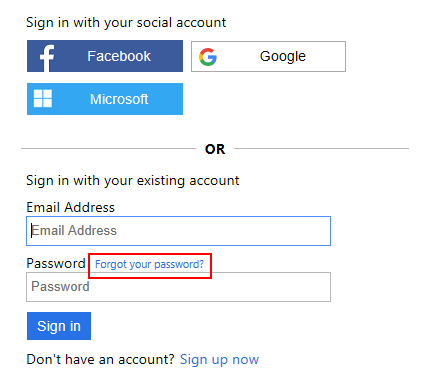 Password reset is another essential self-service flow supported by Azure AD B2C. However as any other flow it's handled by sending the user to the authorize endpoint and because the 'Sign up or sign in' policy does not support it (for the time being) we're going to get sent back to the middleware with an error: AADB2C90118: The user has forgotten their password. when the user clicks 'Forgot your password?'. This has been a lengthy post but I wanted to cover most of the essential stuff you need to know to integrate your solutions with Azure AD B2C. As has been mentioned, the full demo application can be found here.